Golden Lasso Games has been taking our first game to Game Häus Cafe in Burbank for play testing! It’s been wonderful to try our game with a new audience and get their feedback! Want to try out our tarot world-building game, Decuma? Look for us at upcoming Story Games Glendale meetups! Previous: Previous post: Playtesting at OrcCon 2019! Next: Next post: Updated Cards & Video of Decuma! Sweet! 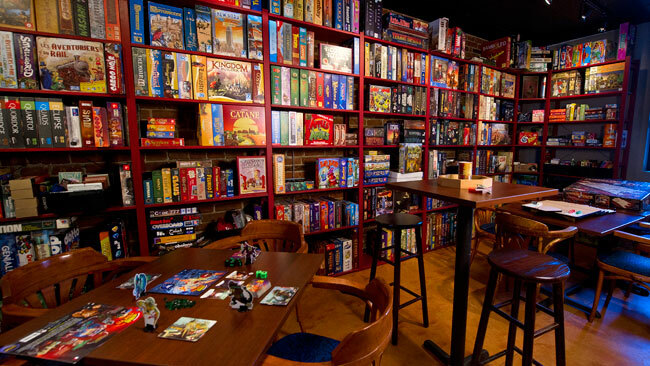 And if you are reading this and wondering about “story game nights”, just know that it’s not sponsored specifically by Game Haus Cafe, but actually a meetup called Story Games Glendale (found at http://meetup.com/Story-Games-Glendale/). David and I founded it over 2 years ago, and although we primarily do the bi-weekly Tuesday meet ups at Game Haus, venues may change or be added, as well as game nights. Check it out at the Meetup web site above.